Recruitment. Training and development. These are, without doubt, some of the more exciting parts of your job as a HR personnel. Then there are the not-so-great parts, including having to terminate an employee. Termination will always be hard on the employee being laid off, and communicating this decision in an informal way will not make it any easier. Bringing it up casually in a conversation with the concerned party is nothing short of unprofessional. 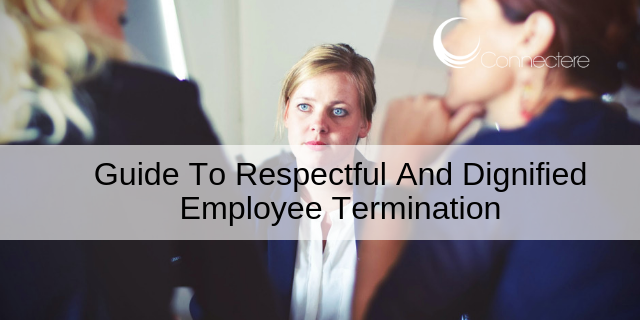 Instead, you should prepare a termination letter and present it directly to the affected employee at a termination meeting. You should keep a copy of the letter on file. “Why?” That is a question that will definitely come your way, for which you should have a ready answer. Being able to give a satisfactory explanation for why you are choosing to terminate can calm even the most emotive of employees. Even as you offer up this explanation, be careful with your word choice and tone. It is also always better if there is any documentation that you can present to back your decision. Be it attendance sheets to show absenteeism, performance reviews or whatever else it may be, providing proof or evidence of any kind is always better than just your word of mouth. Go to the meeting with the terminated employee’s final paycheck. If that’s not possible, make all the necessary arrangements to ensure that they receive that paycheck as soon as possible. You should also liaise with the finance department to ensure that the terminated employee receives any monies and other benefits to which they are entitled. Give all that is due and the departing employee will be less inclined to create a scene. Have you scheduled the termination meeting for the early morning just after the exiting employee gets to work and is trying to settle down? Even worse, is the meeting scheduled for a day that is significant to the employee, such as their birthday? You will have to move it, for the simple reason that the timing just won’t work. Avoid dates such as birthdays. As for the time, give the employee enough time to settle in, and then quietly invite them for the meeting. For some employees, the news may be a bit much regardless of how well you go about the whole affair. With such cases, you are better off leaving it in the hands of a professional. As such, you may need to send the exiting employee to speak to your company counselor. These professional insights will help the employee in dealing with the transition. Whatever you choose to do, the bottom line remains that you should always treat your departing employees with utmost dignity and respect. With the highlighted pointers and more, you will be doing exactly that.